Normally when I tell people things like this, they just give me a very strange look. What can I tell you, this is how my mind works. So I let the idea stew in my head for a bit, and then I got to work. I kind of followed the same process I did for the penguin cupcakes. With a little fondant and step by step directions, they're pretty simple to put together. The first thing I did was color some fondant yellow. I rolled it out, and used a wine glass to cut out the circles for the face. I put a small amount of buttercream on each cupcake so that the fondant had something to stick to, and place the circles on top. The trick part of this was to get the oval shape of an egg on a round cupcake. The answer to this is to use an egg shaped cookie cutter. I rolled out some white fondant and cut out the eggs. 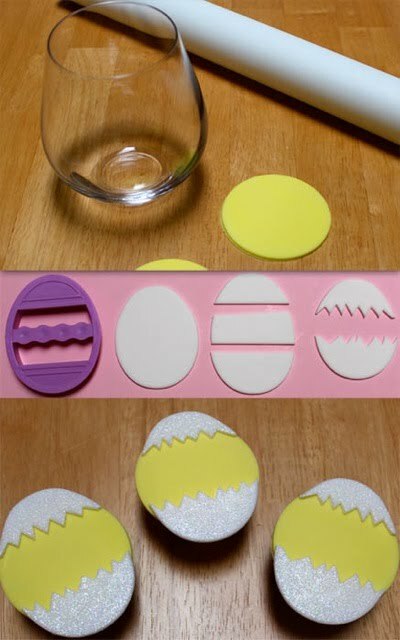 You will see in the step by step photos below that cracked egg shells are easy to make! At this point you can decorate the eggs any way you wish. I used rainbow disco dust, I know you're shocked. The next step is to adhere the egg shell to the fondant covered cupcakes with a small amount of water. At this point it's all in the details. In my world chicks hatch out of sparkly eggs with little flowers, but that's just me! I made their little beaks out of orange fondant, but you could also use a small orange jelly bean. To make the eyes, I dipped a toothpick in black food coloring and drew them on. Their eyes give them a charming look, and the little fondant flower on top is my little finishing touch. I'm really happy with how they turned out, and they're a fun project for Easter or any Spring themed party! I also want to take a moment to tell you guys Buttercream Blondie is moving and getting a makeover! The move is happening in the next few weeks, and I will no longer have Google friend connect. If you want to stay up to date with all my latest posts please subscribe by email so you don't miss anything. Hope you all have a great weekend! Color some fondant yellow & roll it out. Using a 3" ring mold or wine glass, cut out circles. For the eyes: I dipped a toothpick in black food coloring & drew them on. *You can also use those little eye candies from Michael's. You are a genius. These are totally adorable. Haha, thanks Kim! Hope you have a good weekend! Eeeee these are so freaking cute! Love it! Holy crap these are so stinkin' cute. I'm glad there's people like you in the world to be so creative and have the patience do make things like this. Thanks for sharing! Oh my gosh!! how cute are these!!! What a cute idea :) Perfect for Easter! Oh my god they should hatch out of sparkly eggs w/ cute little flowers in everyone's world!! These are SO cute!! The eyes w/ the little eye lashes. These cannot get any more adorable! LOVE this and & thanks for the step by step guide, must try! I think so too! Thanks Lacy! Seriously, these are amazing! I am always impressed when I drop in! Too freakin cute! You never cease to amaze me with your creativity! So creative, Meghan. Absolutely adorable! How adorable! You always do such cute faces on your fondant creations. I still remember the ghosts from Halloween. I also like how "girly" these chicks are with the rosy cheeks and long lashes. Well done and happy Easter Meghan! These are so stinkin' cute!!! I absolutely love them!!! Good work lady!! These are so cute. Very creative. Great Easter treat. I don't know if you do or not, but you should have your own business. You make the most gorgeous treats!!! Thanks Julia! Nice t meet you as well, have a good weekend! You make the CUTEST treats! Love, love, love these!! Oh my gosh, these are adorable! Great idea and execution - love the story of how they came to be. :) Did you go back for the shoes yet? So cute and beautiful! Have a Happy Easter! Thank you! Happy Easter to you & your family! Omygosh these might be cutest cupcakes I've ever seen! These are too cute!! You are such an amazing decorator! I Have a great Easter! I love how girly these chicks look. The eyes are perfect! I just pinned these. Super cute! Love the bright colors. Love your adorable, girly Easter Chicks. What chick wouldn't want sparkly make up and eyelashes for Easter? Thanks Becky! Hope you had a nice weekend! These are so cute! Congrats on Top 9! Those are so cute, such a good idea for Easter. They look perfect for that day! Meghan these are so increadibly cute! So perfect for Easter and I am sure they are delicious as well! Congrats on the Top 9! OK, the cupcakes are very cute. But, where did you get the plate? That's beautiful and so fun for spring. Thanks Amy! The plate is a cake stand that I picked up at Home Goods. As soon as I saw it, I had to have it!